Pioneers in the industry, we offer hitch ball from India. 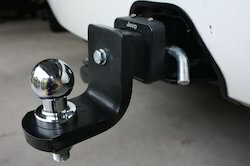 Keeping track with the market development, we are engaged in offering our clients with a wide collection of Hitch Ball / Tow ball that is used for towing purpose. This ball is manufactured using excellent quality raw material and latest technology by our skilled professionals. In order to ensure quality, this ball is stringently tested on various parameters by our experts. Apart from this, remarkable quality and sturdy structure increase the demand of our offered ball in the market. Looking for Towing Accessories ?